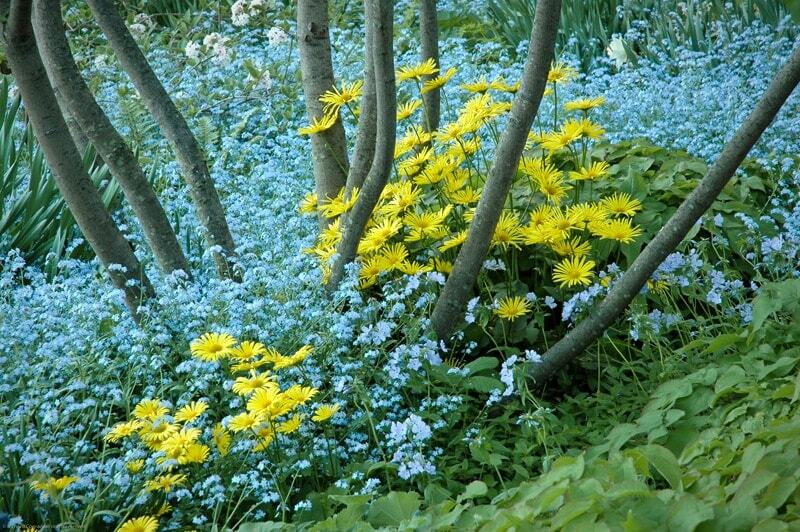 True blue flowers are beloved by gardeners everywhere, and yet blue flowers seem so hard to find. Here we shine the spotlight on five true-blues for spring, from the common and undemanding scilla that will naturalize through the woods; to the rare and finicky Himalayan poppies. 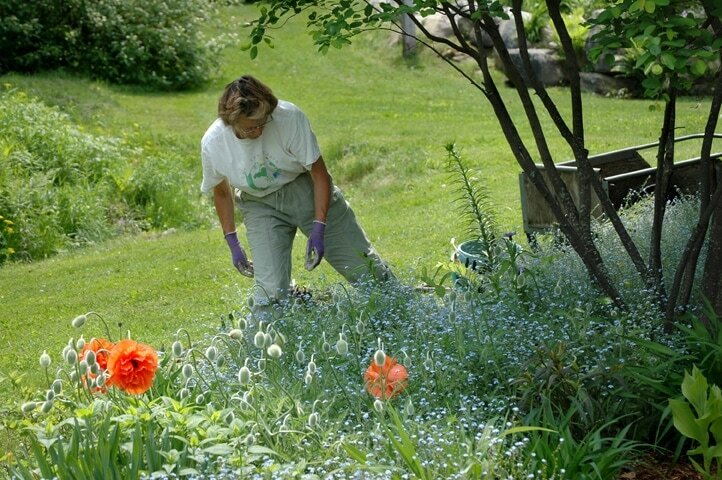 All thrive in my Vermont garden and, as such, should be happy wherever the winters are reasonably cold. Blue is the color of a crystal clear sky at midday. Depending on where you look, its color ranges in intensity from brilliant sapphire away from the sun, to the palest baby blue near the horizon, but it is all blue. I love the purples and pinks of sunrise, but they are not blue. So in the cause of specificity, I wish the people who write our garden catalogs would describe pinkish-blue flowers as mauve and lavender, rather than blue. However our spring blues really are the true thing. And, their drama in the garden will be further heightened if you combine them with a contrasting color, like a clear yellow or pink. 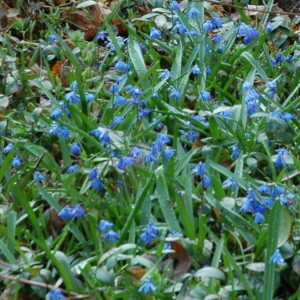 Spring starts out gently, with the lovely blue Siberian squill, Scilla siberica, which blooms in northern gardens for much of April, coinciding with the jonquil daffodils. Scilla naturalizes easily, and for years they have grown and flourished in expansive patch of myrtle at the edge of our woods. They also self-seed easily, and volunteers sometimes pop up in odd places around the garden, even between patio paving stones. For a really big effect, try planting the diminutive squill en-masse. More than once the sight of a huge patch of blue in an in-town lawn in early spring was enough for me to stop the car, gasp and reach for the camera. Next to flower come the forget-me-nots (Myosotis sylvatica), some planned but lots by serendipity. 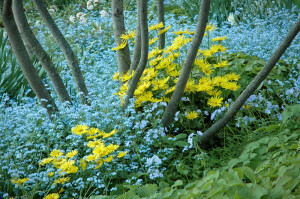 Forget-me-nots are certainly true to their name; every year they create a splendid carpet under our serviceberry trees, where they are a perfect foil for the cheery yellow daisy-like flowers of Leopardsbane, (Doronicum). People tend to scoff at forget-me-nots as weedy. Certainly after flowering they quickly become tatty and mildewy. So I enjoy the flowers while they last, then assertively cull the plants. This is a quick job and it clears out the beds for the summer perennials that follow, and still seems to leave a few plants, along with plenty of seeds, to create next year’s display. The pleasures of forget-me-nots, was brought home to me when we visited the Hamesbest Lilac Display gardens in Randolph Center, Vermont in late May. Forget-me-nots completely filled the beds with the lilac blossoms hovering above. Virginia bluebells also self-seed, with the progeny showing up several feet away from their parents. 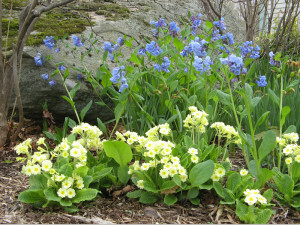 But by mid-June Mertensia plants have completely disappeared below ground. So, if you want to enlarge your spread for the following year, take a few minutes in early June and move any strays back into the fold. Over the years I have nurtured quite a respectable colony in front of this large rock, faced off with some yellow English Cowslips. I also grow some old-world bluebells as a wildflower in the rough grass at the edge of my garden. 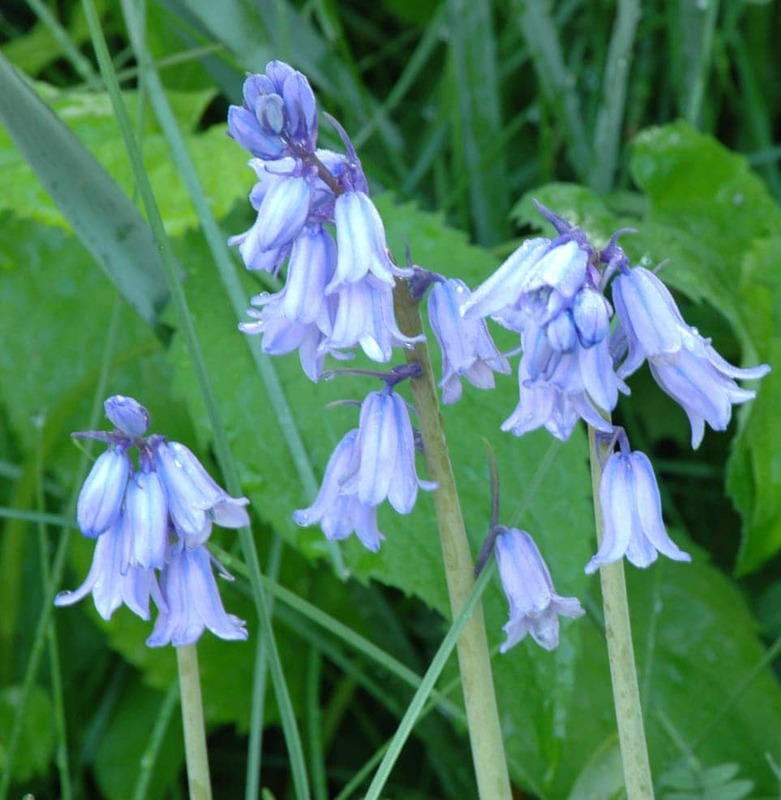 These Spanish bluebells (Hyacinthoides hispanica) are a close relative of the English bluebells (Hyacinthoides non-scripta) of my childhood. I can still recall the wild bluebells in the woods near our home in southern England, where in April they made the most amazing carpet of blue that seemed to stretch for ever. While genetically unrelated to their Virginian namesake, old-world bluebells certainly match them in color. 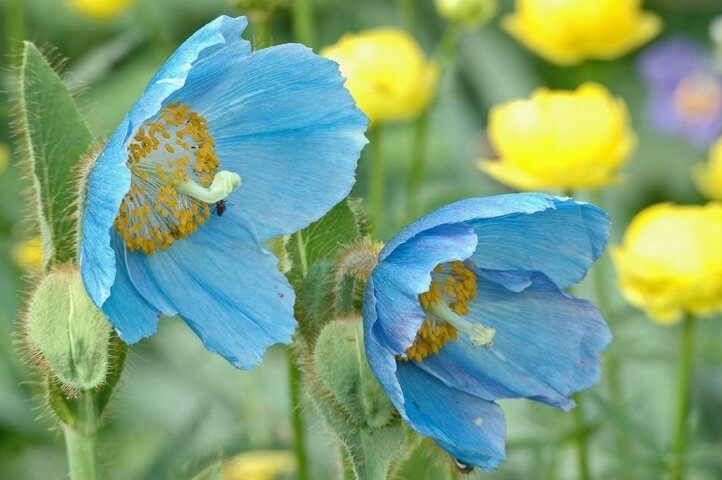 .A few years back I succumbed to the lure of the renowned Himalayan blue poppy. Cady’s Falls Nursery in Morrisville, Vermont offers two varieties and in 2005 I bought some Meconopsis betonicifolia. Blue poppies are famous for two reasons…they are really fussy to grow, and they are a startlingly different shade of blue. You can see in this picture how this unusual blue stands out against the clear yellow of the globeflower, Trollius europaeus. Following the detailed directions provided in the Cady’s Falls catalog, I sited my new plants where they would get a few hours of shade at midday and amended the soil generously with compost. So far the poppies have obliged me very well, flowering here in early June. Veronica austriaca ‘Crater Lake Blue‘ is the most intense and deep hue of any flower I know. As with all blue flowers, a contrasting companion makes a far more compelling picture. 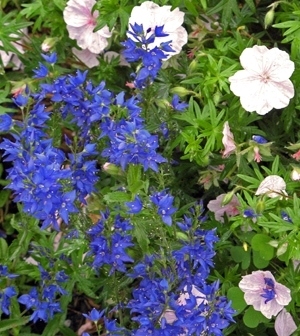 I planted the veronica alongside a pink-tinted geranium, Geranium sanguinium ‘Lancastrience‘, which bloom together during the last half of June. As I contemplate these spring blues, I realize that, like so many gardeners, I have a very special spot in my affections for the ‘true blues’.